Relatively Retiring: The Winter of My Content. Christmas Eve is a poignant day. My husband left home on Christmas Eve three years ago to take some last-minute Christmas cards to friends, and never came back. His body lived for another ten months, but his mind did not. He and we never knew what had happened. Despite this stark initial message, this is a story of hope and happiness, of growth and acceptance and rediscovery. It was a journey into the unknown for my husband, through the tortuous paths of brain damage, and for our sons and me in our attempts, if not to follow him, then to be alongside him in his confusion and distress. We learned so much, all of us, about each other and ourselves. I have always been proud of my sons (sometimes irritated, occasionally furious; always proud), but through the profound experiences we shared they became transformed before my eyes into wonderful adults: caring, thoughtful, funny, clever, hard-working, lovely people. We grew, all of us. Growth as a Senior Citizen is a challenge, and a challenge that I did not always wish to meet. The creaking crystals in the knees were ignored as I forced myself out into the garden, come rain or shine. Never once did I feel anything other than refreshed and energised by having my hands in the soil. The stiffening fingers were also limbered up on the word-processor. I even learned to blog. My younger son gave me his old digital camera. It was exactly what I had been saying about homework, a few years back. I made new friends, and had the joy of being reunited with old ones. I discovered that I had resources and strengths that I had never drawn on before. I learned to be alone, without being lonely. I learned the immense value of solitude. Now, as always, there is new growth in the garden. Invisible under the dark soil, things are stirring, reaching out to new life. Growth always happens when you are not looking for it. 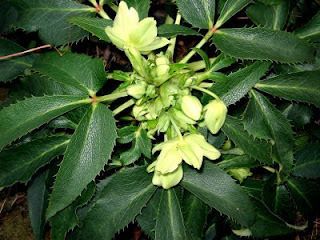 I went out into the dark cold air of this winter morning, and the hellebores were in flower. This, too, like P'Pete's post a little while ago, brought tears to my eyes, R R, but how good it is to read about new growth coming out of the darkness. I'll be thinking of you on Christmas Eve. Wow. What mixed feelings Christmas must bring you. The living things that blossom and those that stay green this time of year continue to be a strong symbol of life and new growth at the darkest time of year. Wishing you joy and peace this season. I can only think in cliches, and this feels way too important for a pat comment. Thank you. I am honored to have found your writings. Thank you, RR. Peace and joy to you this coming season. Peregrina, HHnB, Les, Zhoen and mm: thank you all. Very much. My life has been enriched by meeting you. What can I add? Very touching indeed. I've never had such an experience but I do agree about gardening: I feel it's a wonderful antidote to gloom (minor gloom, anyway). There's always something to look forward to: in my case, the spikes of crocus among the soggy brown leaves. Isabelle: Thank you, and I hope the Santa suit gets full use. Yes, the constant cycle of growth is wonderfully consoling. I hope you all have a very happy time together. Very moved by your post, and I'll be thinking of you on Christmas Eve. Thank you Jan. I appreciate your kindness is leaving a message. My best wishes to you. I remember the last time I saw him — it was hugs all round at the railway station as I left and I wondered whether I'd ever see him again. He felt so frail, and so resilient. Still I'm lucky I have those memories, unclouded by the anguish of having to see him yet not him. I still hope another visit might be possible. And Merry Christmas to you and the lads. I think of you all, often. PPete: You know the thoughts are mutual, and the Little Lads will be home soon to join in thoughts of all the Clan, past and present. Your musings are very thought-provoking. I face life with a husband much older than I am, who is becoming more feeble and forgetful, and feel that our paths are similar. To be able to grow and to keep discovering the capacity for growth is wonderful. 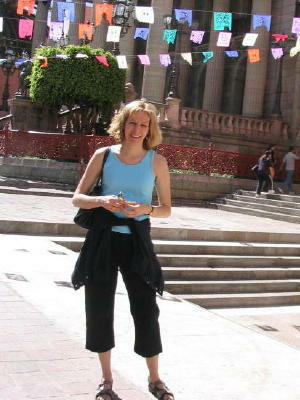 Persiflage: thank you for your comment, and for the introduction to your blog. I am so sorry that you are facing this challenge. Please feel free to e-mail me if a cyber-talk is of any help. Wonderful writing. I have been greatly moved by your writing, and will be wishing you and your family much happiness in the new year. Thank you for your kind comments, Anon - and a very Happy New Year to you. This post chocked me up and left me teary eyed, feeling both sadness and inspiration. I am so glad that through your pain and that of your family, you were also able to grow in both life and spirit.